The Beer Chair – The best seat in the house! 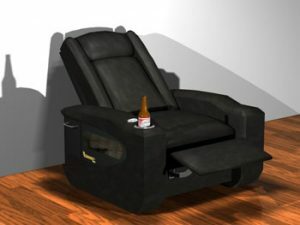 The Beer Chair is a trendy, streamlined reclining leather armchair with a built in beer cooler/dispenser. Its simple yet stylish design allows for an easy fit with existing furniture and household décor. Its ergonomic design coupled with unique neck and back cushions make it an extremely comfortable chair for any occasion whether it’s watching the big game or just spending time with friends. Its built in beer dispenser not only propels a beer into your hand at the press of a button but also has a practical use; it keeps your beers cool. Simply open the fridge door located on the side of the chair and load your six pack of game time refreshments. 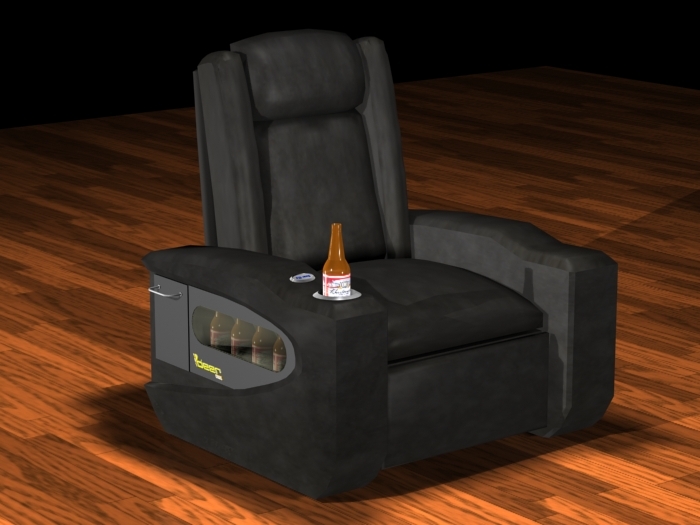 (The Beer Chair can accommodate cans, long necks and stubbies) When you’re ready for a beer all you need to do is press the “beer me” button located on the armrest. A small platform will lower, retrieve a beer from the silent thermo-electric cooled fridge and bring it up, perfectly chilled and ready to drink. In order to keep your beer cool all you need to do is place it down again on the platform and it will recess about four inches, keeping your beer at the perfect temperature. Please visit our gallery to get a full perspective of The Beer Chair and complete our survey to let us know what you think.